Concept: A home services company that caters for all types of home renovations and maintenance projects. IDWork employs only skilled and experienced plumbers, builders, contractors, electricians and handymen who have been background screened and are highly recommended by existing customers as well as the community in which it operates. It was while studying to become an actuary that a business idea that has the potential to stimulate a completely different kind of problem-solving and provide a service that would impact lives in a positive manner revealed itself to Arjun Khoosa, co-founder of IDWork. Hence, the beginning of 2015 marked a major shift for Arjun in that he abandoned his academic pursuits and literally made the transition ‘from numbers to nuts and bolts’ with the establishment of IDWork, which is a home services company that caters for all types of home renovations and maintenance projects. IDWork employs only skilled and experienced plumbers, builders, contractors, electricians and handymen who have been background screened and are highly recommended by existing customers as well as the community in which it operates; an extremely effective approach that inspires trust and confidence among customers. “From the outset, it has been my intention to revolutionise home services. I am proud to say that I am the type of boss who is not afraid to pick up a hammer. I believe in empowering staff without being seen as the ‘bakkie driver’, Arjun confirms. During the first half of 2015 Arjun was contacted by Aimee from Seed Academy. As a consequence, the beginning of Arjun’s entrepreneurial journey also coincided with his enrolment onto the TBD programme. “Seed Academy has really helped open doors for me. I have learnt so much from attending the programme. Seed provided me with an excellent platform for networking, sound mentorship as well as dedicated office space as an operational base. One of the greatest benefits of working with Seed has been that I have learnt how to pitch to big business. I was given the opportunity to pitch to IBM where I subsequently won the pitch and have since formed meaningful business relationships with IBM. Establishing networks and focussing on building a comprehensive offering were very real challenges for me. 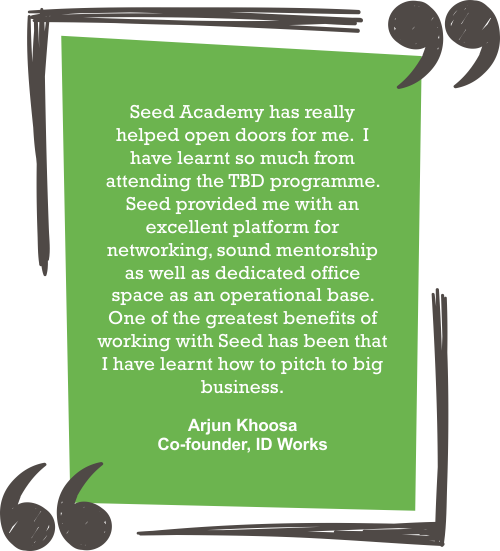 Seed Academy has enabled me to address these challenges,” Arjun reveals. I would definitely recommend Seed Academy to other entrepreneurs. I believe that the people at Seed aim to empower entrepreneurs through being a social enterprise, which is hugely important. Aimee, Warren and Donna have been incredible – they really take a sincere interest in developing businesses,” states Arjun. Since working with Seed Academy, IDWork was selected as South Africa’s best start-up by Seedstarsworld.